I tried not to sweat all over the dress but was unsuccessful. Even under my shady tree, it's pretty hot. 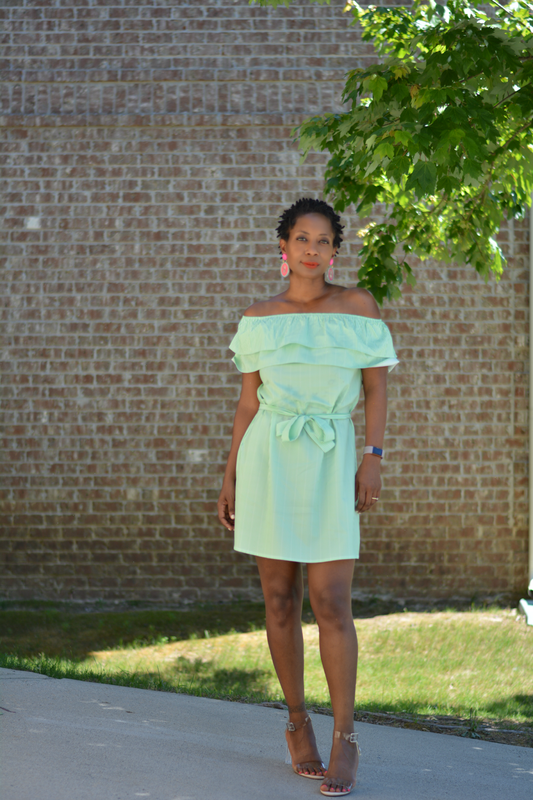 The light green sherbet color of this shirtdress isn't keeping me particularly cool either. I'm always a little apprehensive when I buy cheap clothes on Amazon but this one turned out to be a winner. The polyester fabric doesn't absorb the sweat at all. Otherwise, I'm pretty pleased. Off the shoulder ruffles are my jam. I hardly ever buy new clothes anymore. I prefer the cut and quality of my thrift store finds. While searching for some other random purchase, the dress appeared as inspired by recent searches. It reminds me of the men's shirt I refashioned. 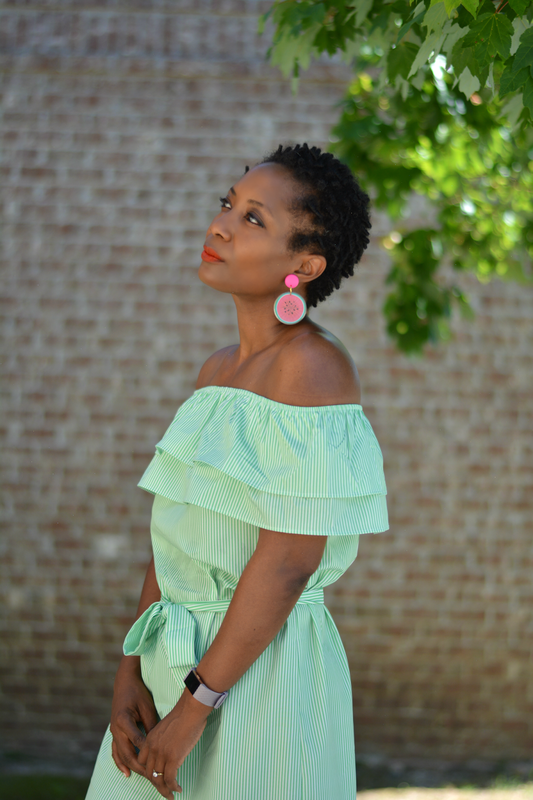 The dress has a nice off the shoulder double ruffle neckline that I'm really digging for summer. My only thrifted piece in this look is the watermelon earrings. They're so perfect with the dress. That little pop of pink is a nice addition to the color scheme. 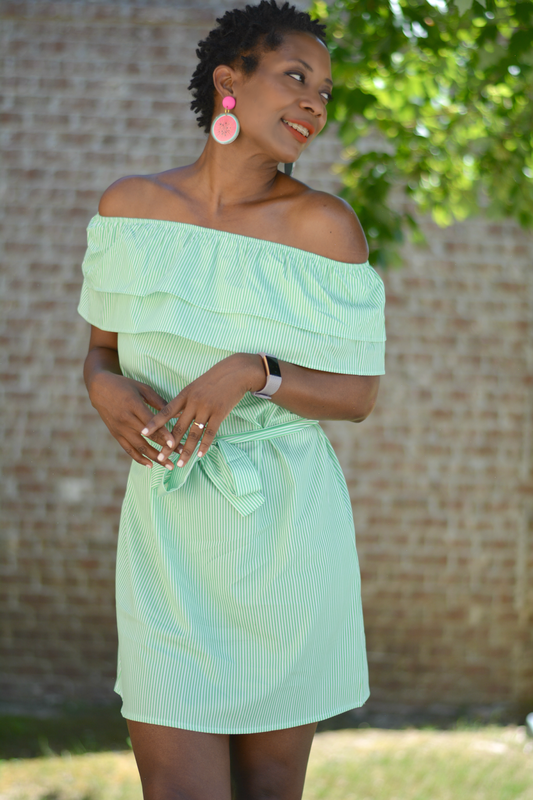 The stripes are very formal but the whimsical earrings really add a fun vibe. I imagine watermelon prints and accessories as the pineapple of today. Want some freshness and fun? Put a watermelon on it! The lucite heels will now be my summer neutral. A colorless shoe obviously matches everything. They're reasonably comfortable and I'm totally digging the clear heel. I first saw the "stripper heel" on a pair of Steve Madden sandals but I wasn't sure about spending $100 on a trendy piece that my fashion fickle will likely hate in a couple of months. I searched Amazon and found a similar sandal at a quarter of the price. This is what I wore to Mother's Day brunch. I felt so pretty and chic sipping mimosas in the shade. It was a good day.